BACK ON MARKET at no fault of the Sellers!! 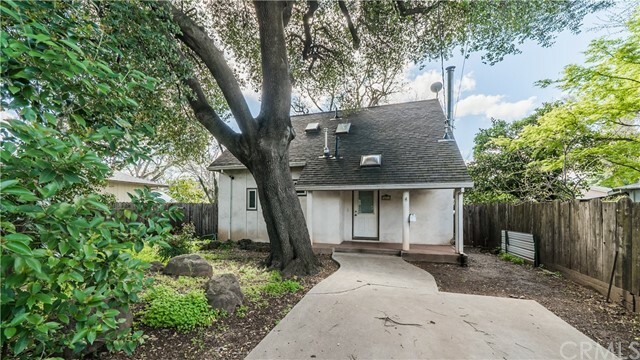 Energy efficient, low maintenance, affordable 3 bedroom, 2 bathroom home is ready for its new owners in Chico! Built in the early '90's, this young home has a cool vibe and is ZONED R2 if you wanted to investigate adding a second unit/structure! As you pull up, you see that the home sits back off of the street, giving you a more private front yard feel with Japanese maple trees and some mature landscaping. Enter the front door to a landing with hardwood floors, large coat closet/storage area and the real hardwood staircase. Step down into the living room/open kitchen or head up the stairs to 2 bedrooms and 1 full bathroom. The home features HEATED stained concrete floors in the kitchen and living room (how cool is that? ), dual pane windows, french doors leading you to the back yard, skylights, DOWNSTAIRS MASTER BEDROOM AND BATHROOM and wood burning fireplace. The kitchen has white cabinets, tile counters, a retro gas stove and lots of natural light filtering through. The backyard has a concrete patio, enough room to hang out and BBQ, a storage shed and dog runs on each side. Additional feature includes on-demand hot water heater to add to the energy efficientness of this great home!